London-based photographer Srinivas Kuruganti’s interest in coal mining began during his many travels in India. In 1999, during a bus ride, he crossed a small town called Chandasi—a short distance from Varanasi in Uttar Pradesh. “The air was so thick with fine particles of coal dust that all the shops, houses and roads were coated black," Kuruganti recalls. “It’s as if the city was layered in coal dust." Chandasi, he learnt later, was the biggest coal depot in Asia. As a photographer with a long-running engagement with the daily lives of manual labourers such as those in the ship-breaking yards of Mumbai, and the coal-mining industry, Kuruganti says he got the chance to highlight labour and living conditions at a time “when extreme industrial pollution was not only transforming the workers’ ancestral lands from fertile fields to barren landscapes but also causing serious health hazards". This week, the first film from film-maker Anurag Kashyap’s two-part opus, Gangs of Wasseypur, introduces film audiences to the murky underbelly of the coal mafia of Dhanbad and neighbouring Wasseypur. The film spans the expansion of the mafia from the 1940s to its diminishing scope in later decades. While the movie suggests the ruthless suppression of mine workers and poor living conditions, Kuruganti’s photo series lays this out bare. Kuruganti’s aim was to provide a “360-degree view". Although his interest in coal mines stemmed from an interest in labour and human rights, all too soon each issue seemed worse than the other—from the appalling living and working conditions to the health hazards the workers face, the issue of child labour, and that of underground fires claiming homes. “In Jharia, a major coal-mining town in the area, there are hundreds of underground fires that first started more than 90 years ago when the companies began to mine. Bokapahari is another area where the fires are so widespread that most families have been forced to relocate many miles away," says Kuruganti. Kuruganti’s photographs span this spectrum of issues, while also providing portraits of mine workers (including underage ones). 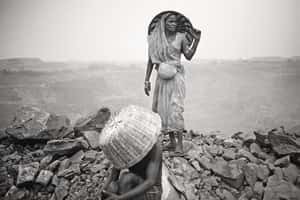 The photo series covers collieries in several villages in the Dhanbad area—East Bussuria, Jharia, Bokapahari, Kasunda—all owned by government-run Coal India Ltd (CIL), one of the world’s largest coal miners, with revenue exceeding ₹ 62,415 crore (fiscal 2012). After his first stint, Kuruganti returned to Dhanbad in September 2010 to see how things had changed. “The standard of living of the communities—mostly Adivasis—dotting the highway and villages close to the mines hadn’t improved by a fraction. Underground fires had spread further, causing more damage to homes," he recalls. “So many homes had numbers marked on them as families who’d been scheduled to be relocated as far as 23km away." Officials from Bharat Coking Coal Ltd, the Coal India subsidiary that operates the mines in the Dhanbad area, were not immediately available for comment. The company does have a programme of relocating people affected by underground fires and two senior Coal India officials, who didn’t want to be named owing to company policy, said CIL and its subsidiaries have a policy of spending 5% of the net profit each year on corporate social responsibility programmes that fund community welfare projects ranging from healthcare to education. Kuruganti plans to revisit the area in future to continue his documentation work. “Coal India is the largest corporate employer in the country. The coal mines still continue to make massive profits, of which very little, if any, benefits local communities," he says. "It’s all so dark." Ruchira Singh contributed to this story.